"Simple program that shows a preview of your Gmail inbox"
Gmail is one of the most popular email service provider in the world. It features a great spam blocker, offers over 7GB of storage space, an amount that is constantly increasing. Next to that they offer a very clear interface that allows you to easily search and view conversations, and more. If you use check your Gmail inbox quite often, then you should try this application. Gmail Notifier Plus is a simple application that provides quick access to Gmail and its components. 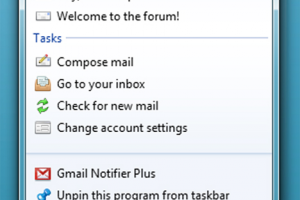 Gmail Notifier Plus runs as an icon in the task bar. With a single click on it, you will get access to a list of your most recent unread messages, which you can preview by hovering the cursor over them. The program will also let you know when you receive a new message or if someone is sharing a document with you, and it monitors all other services by Gmail that you might use. It runs on low resources, so you won't even notice it, but be sure it will be a great help and save you time.